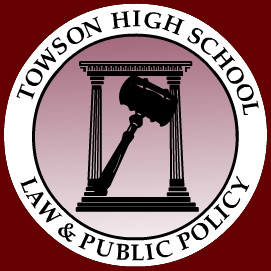 The Law and Public Policy Program is an interdisciplinary magnet program that Towson High School is fortunate to include among its comprehensive areas of study. Topics relevant to law and public policy are used to develop strong communication, writing and presentation skills in students who are highly able and college-bound. The program focuses on unique academic course work, leadership opportunities, extracurricular involvement, and real world experience to enhance class room instruction. The rigorous curriculum is designed to develop the essential skills of active citizenship, and a comprehensive appreciation for the principles and values upon which the law, legal processes and the entire legal system are based. Course work is designed to emphasize student involvement and includes the use of technology and research as integral parts of instruction. In addition, students participate in field experiences including, job shadowing, and internships in a variety of related law and public policy professions. Admission to the Law and Public Policy Program is based on academic achievement in middle school. Accepted applicants will have maintained quarterly grades of no lower than a B average in all core curriculum subjects taken in 7th grade and the first quarter of 8th grade. Core curriculum includes English, Math, Social Studies and Science. In addition, candidates for admission should be taking Algebra I or higher in 8th grade. Applicants will also be evaluated by performance on the admissions assessment and the completion of an essay written on site at the time of the test. The essay does not require previous knowledge of law or any specific academic subject. Office of Magnet Programs website. In order to graduate from the LPP program, students must earn 7 credits from the courses listed below. Students are introduced to law in American society and the rights and responsibilities inherent in our judicial system. The course provides students with a practical understanding of the legal system that will be of use in their everyday lives.